You may have seen ads for the Topsy-Turvy upside-down planter sold on the Web. 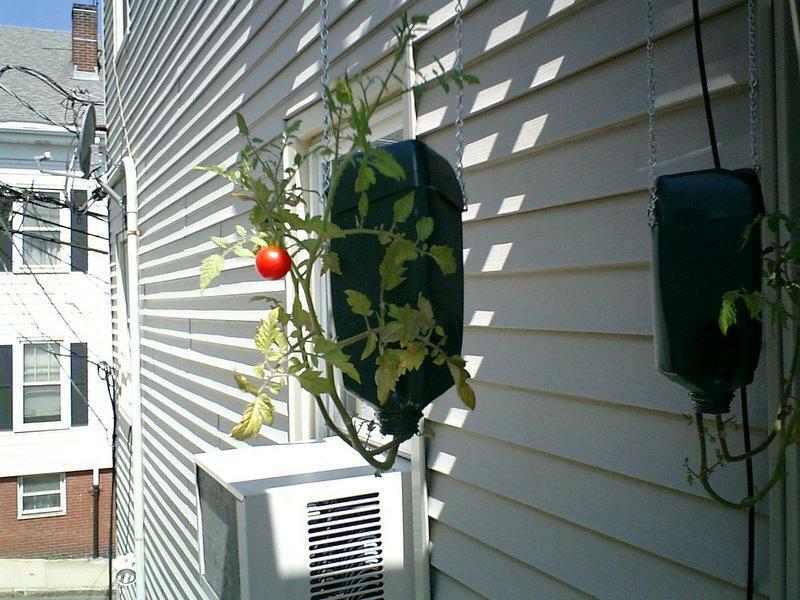 It is a clever way to grow tomatoes and other vegetables because it eliminates the need for a backyard garden plot, stakes, weeding, hole digging, worms and in-ground insects. The planter also looks cool on a deck or balcony and is sure to capture visitors' attention. Here’s how to make your own upside-down planter from materials around the house. It likely won’t cost you a penny and will only take 15 minutes. Click the thumbnails for larger images. Empty ½ gallon milk container. 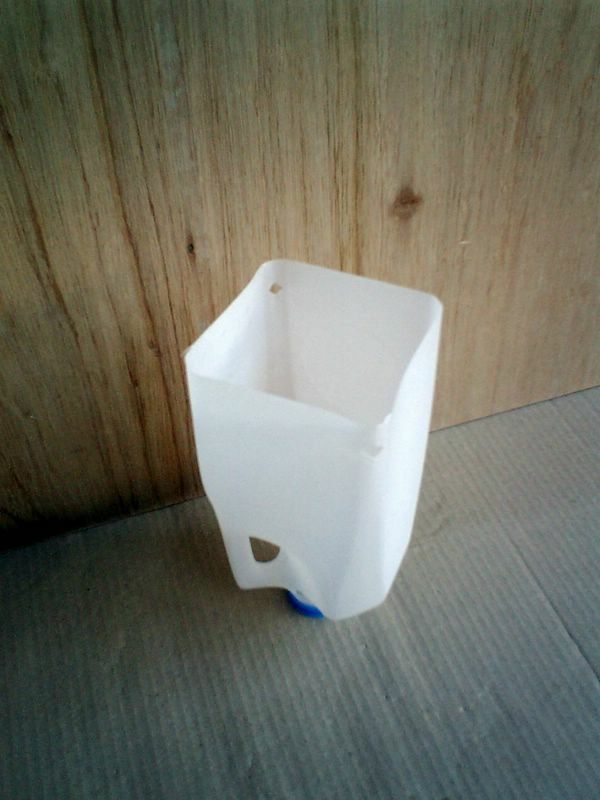 Other plastic containers and bottles work too. Just make sure they are food grade plastic so that the plant growing inside is safe to eat. Plant seedling (tomato, bell pepper, chili pepper). Choose a variety with small fruit. Note! The planter is not designed to grow plants from seed. You should use a plant seedling that is ready for transplanting outdoors. Cut off the bottom of the milk container two inches from the bottom. This will become the lid of your planter. In the remaining container, cut two holes in opposite corners about 1 inch from rim. Tip. Don’t make holes on the side where the handle is. This way the handle will be hidden in the back when you hang the planter. In the bottom piece you cut off, cut two slots in opposite corners. The chain or string will run up through the slots. Optional step: Cover your work area with newspapers and paint the planter. Spray paint is easiest. Spray two or more layers while letting the paint dry in between the layers. I painted mine dark green to make it look more like a planter and less like milk bottle. Also, plant roots like to grow in dark. Important! Don’t paint the inside of the planter. The paint may contaminate the soil and find its way into the plant and eventually into your body. 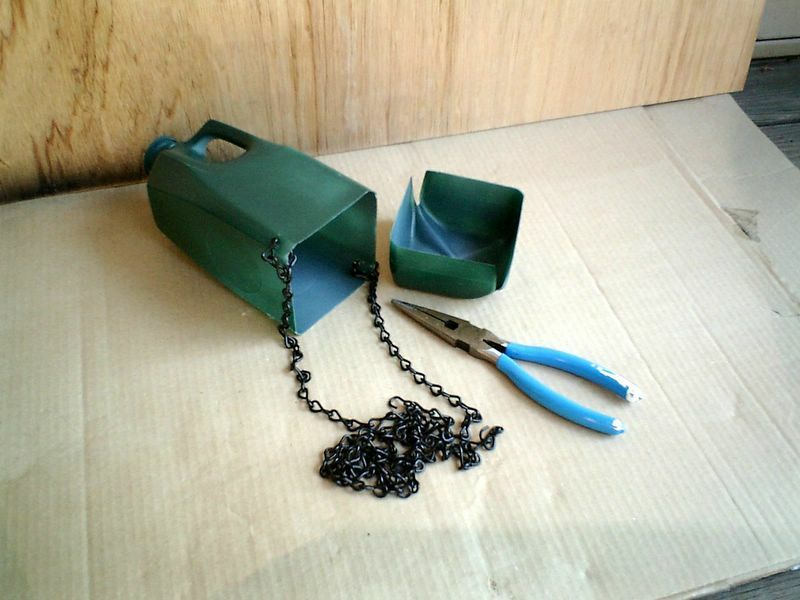 After the paint has dried, attach the chain or string into the holes you made in the bigger piece. Use needle nose pliers to open and close the chain loops. Screw the hooks (or nails) into a terrace beam or other wood surface on the sunny side of your house. 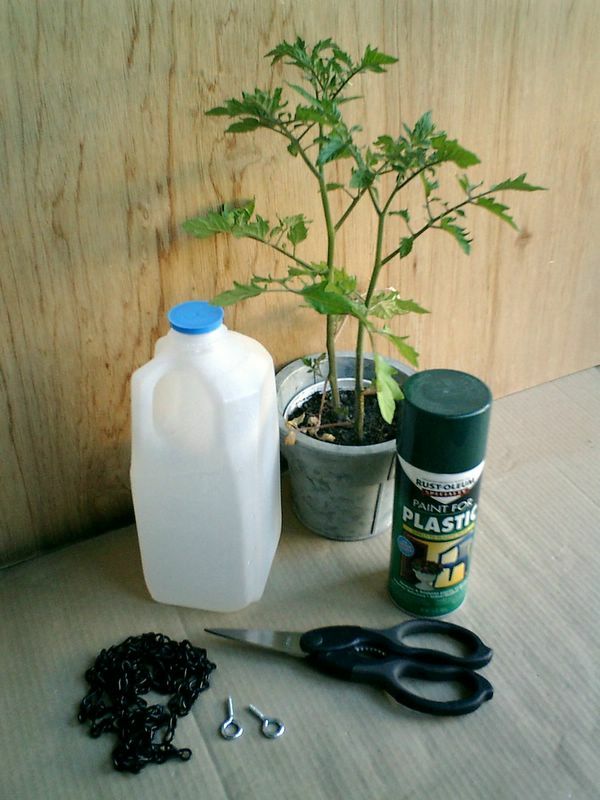 Wrap the plant into a sheet of newspaper to protect it as you push it through the container opening. 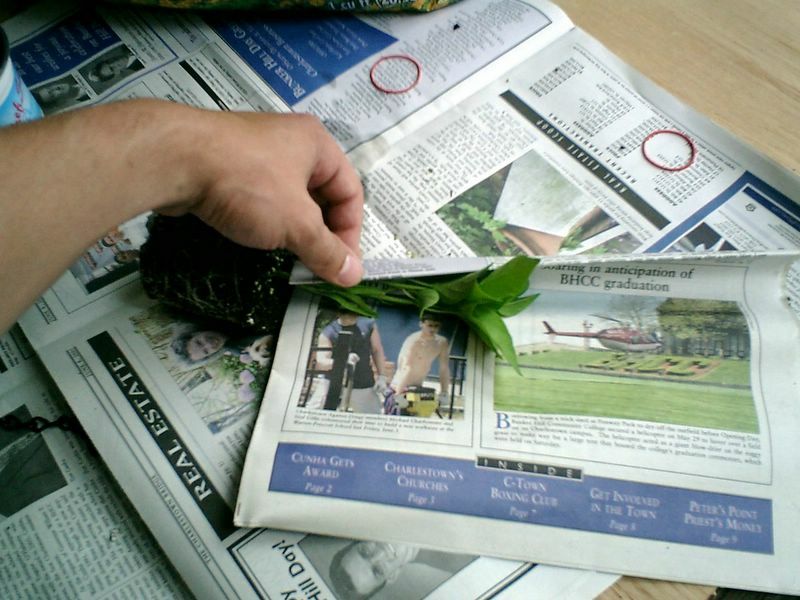 Use a rubber band to hold the newspaper around the plant. Holding the plant root ball in your hand, push the plant through the bottom of the container and out from the top opening. Help with your other hand to guide the rolled up newspaper through the opening. Firmly fill the planter with moist soil. Leave 1 inch from the top empty. Make sure you put soil everywhere around the root ball. Put the lid on and hang the planter from the hooks. Lift the lid and carefully water the plant. As some of the water will run through, it is a good idea to place a potted plant underneath to catch the overflow. The plant will adapt to the upside-down position in a few days. It turns around and starts to grow up towards the sun. Learn why. Update 1: It's July 23, about a month since I moved the tomato seedlings into the hanging planters. Some fruit are beginning to pop up. 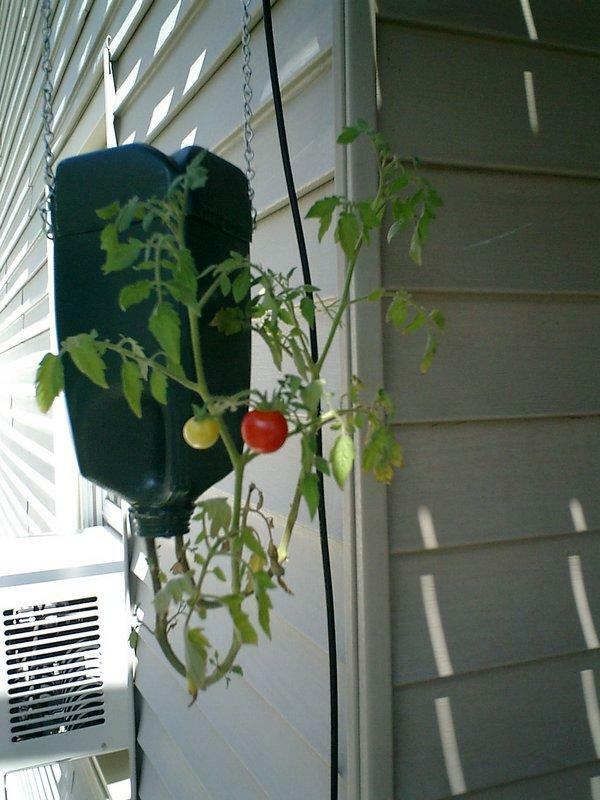 Cherry tomatoes don't grow any bigger than in the picture, which is a perfect size for the hanging planter. Bigger tomatoes might weigh down the stems. Update 2: It's September 15. I have harvested about one dry pint of cherry tomatoes from the two hanging planters. To get an idea of how well they yield compared to ground plants, I planted the same variety on the ground. The ground plant has yielded a much larger crop, maybe four times as many tomatoes. I think the culprit for the small yield is watering. 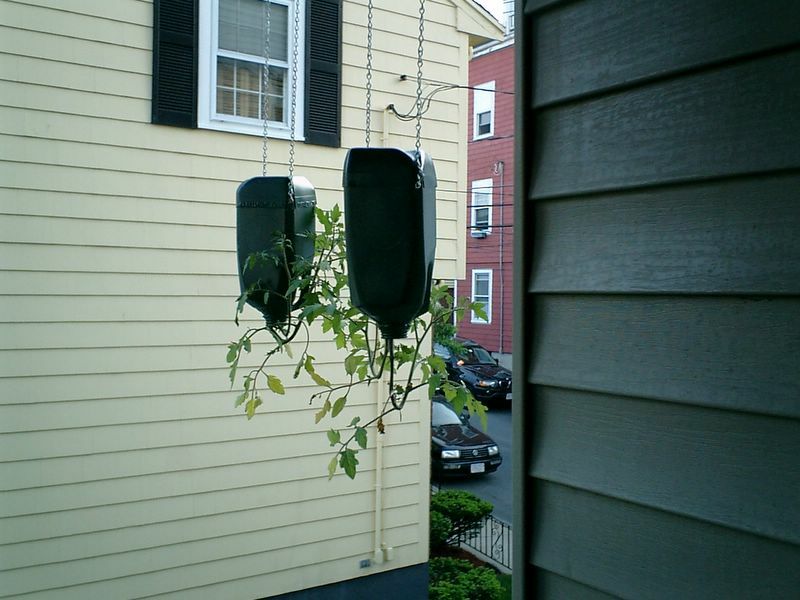 Since the hanging planters don't hold much soil, the soil inside the container dries easily. I have had to water them often, pouring the water in slowly so the dry soil would hold it instead of letting it run out the bottom right away. 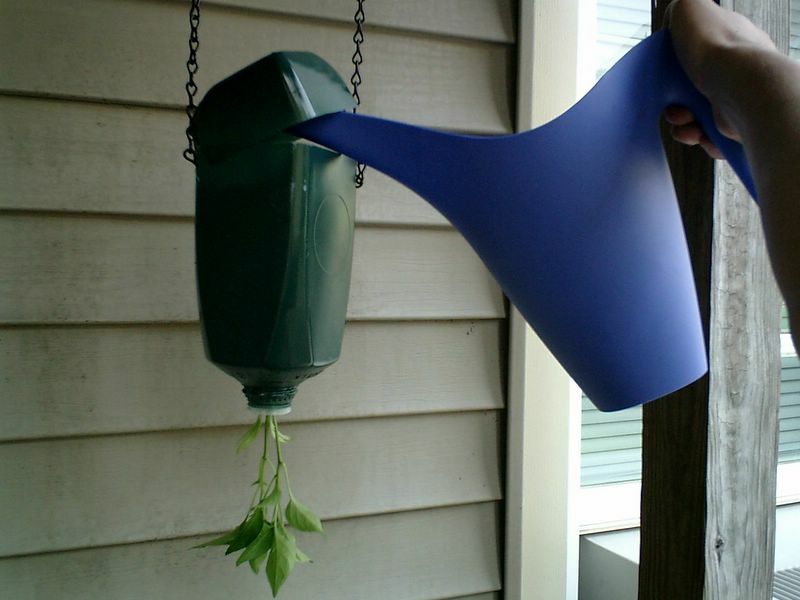 One solution to the watering problem would be to install a drip feed that keeps the soil moist at all times. 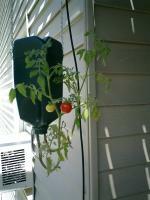 I am thinking of a water tank such as a soda bottle suspended above the hanging planter with a drip feed regulator. This is an enhancement I need to try next summer.